When you hear the term, eclectic, the first thing that would come to mind will be weird shapes, irregular designs and the likes. When this term is used in the design industry, it is used to refer to the type of design wherein there is a spectrum of mismatched textures, designs, patterns and materials. In short, eclectic style is all about taking each and everything from the different décor styles and incorporating it in one kitchen. We all know that the look of the kitchens is all about proper lighting. 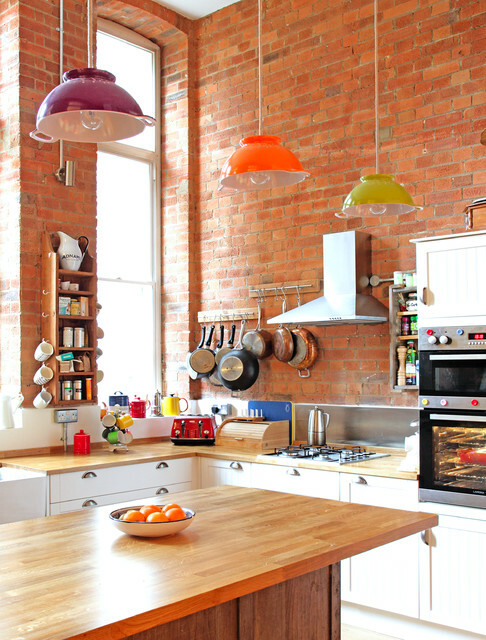 Well, you can make your kitchen look more interesting using light in more ways than one. 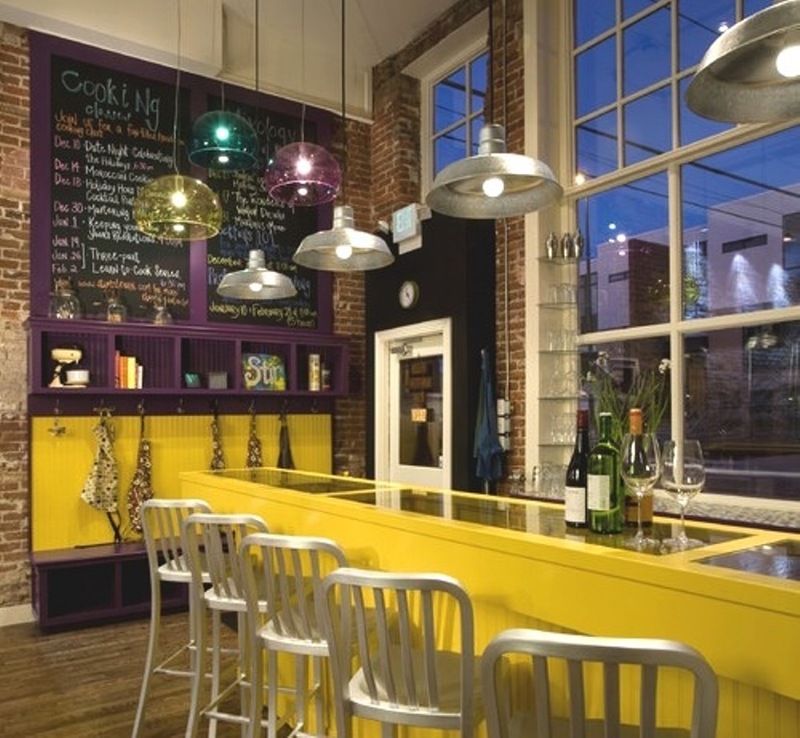 We recommend that you opt for colorful and unique light fixtures like the ones that you can see from the picture above. As we have mentioned above, eclectic design is all about mixing interior styles. 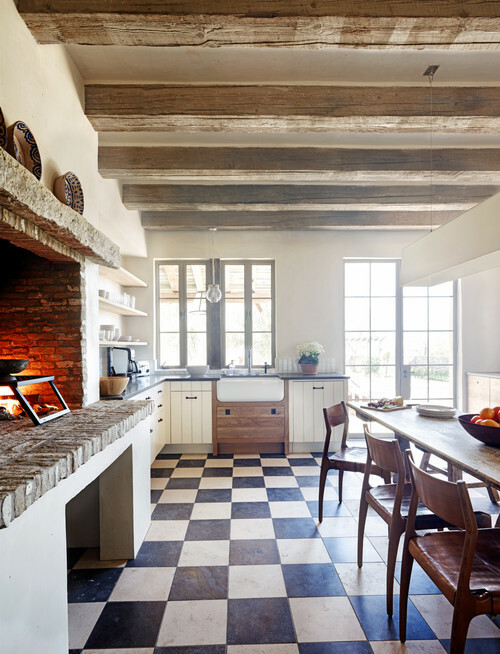 The kitchen featured above shows a rustic charm with its wooden ceiling, rustic fireplace and wood stools. Additionally, it also features a touch of retro style with its black and white tile flooring. 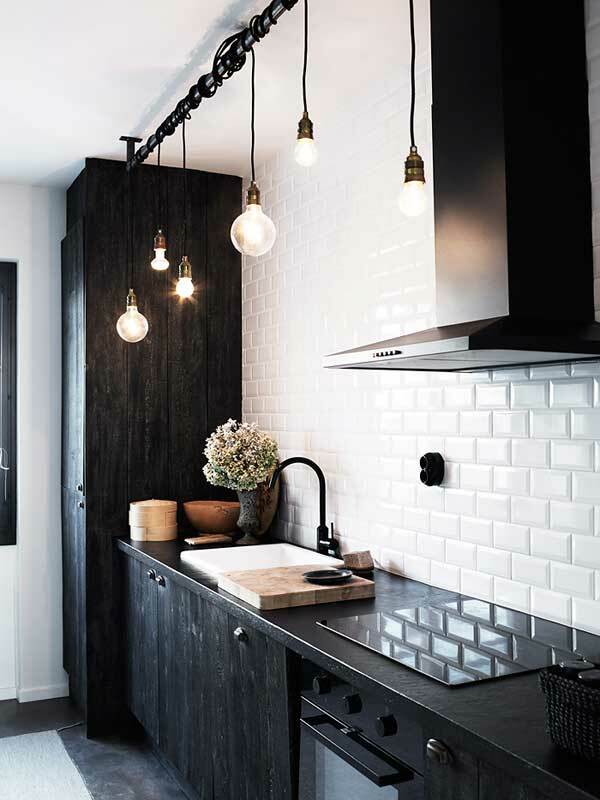 This kitchen features another way on how you can incorporate eclectic design using lighting in your kitchen. Today, string of lights can be seen in various events and parties so there is no reason for you not to use this as a touch of style in your kitchen. 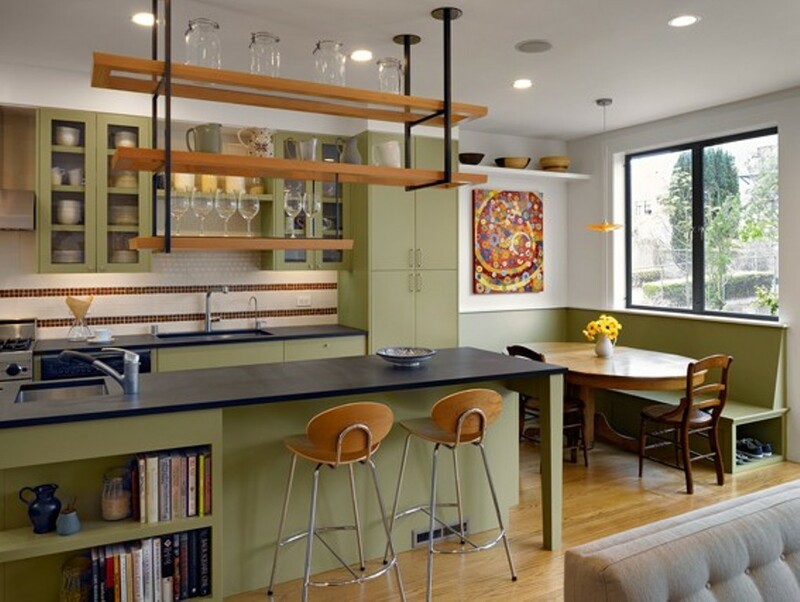 This kitchen is a wonderful example on how you can mix two different materials together. Interior designers are loving the sleek look of the metal and glass china, pots and pans display. 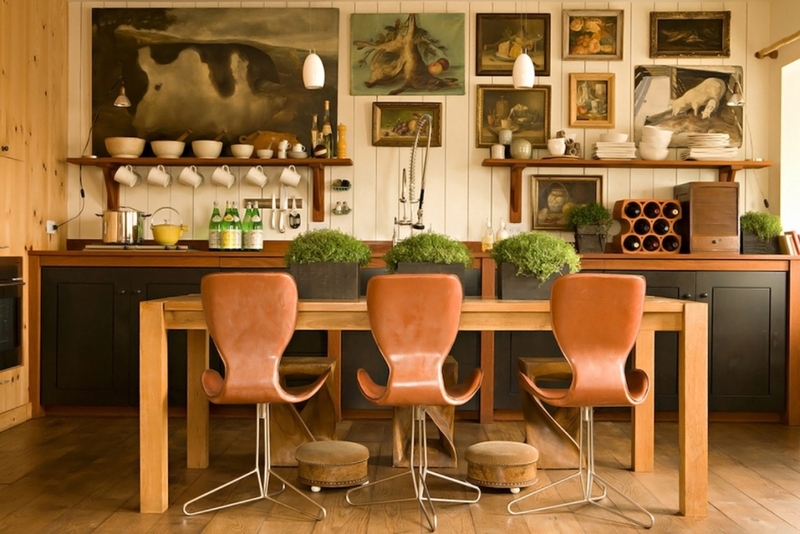 It is then well blended with the homey appeal of the black wooden table and chairs. Once again, here is one good example on how you can blend different materials from different interior design styles into one good looking kitchen. The fur on the chair speaks elegance while the silver lights and oven looks modern and the wooden kitchen countertop, table and exposed brick walls look amazingly cottage. Artistic designs and natural items are two things that will never seem to go well with one another. However, this kitchen design definitely took us all surprised on how natural and artistic everything looks. The live plants and artistic paintings are an unexpectedly perfect match. To make eclectic design more dramatic, we recommend that you use bright colors like the combination of bright green and violet colors featured above. The metallic stools make the look more industrial and chic at the same time. 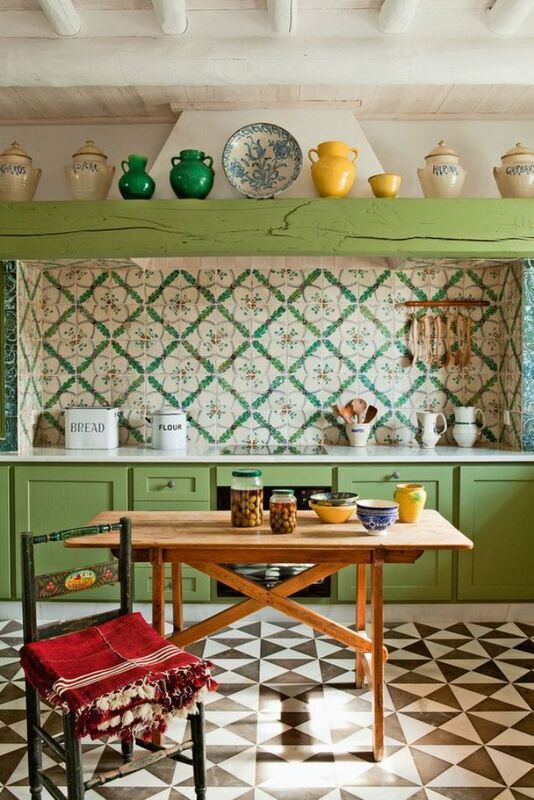 The vintage looking backsplash has truly added more character and style to this Mediterranean looking kitchen. Oh, let us also not forget about the contrasting effect that the black and white geometric floor has created. The pastel green walls paired with the funky decorative palette is already heavenly. Add in the hanging rack over the kitchen island and it can be one of the best eclectic kitchen designs that we can see. 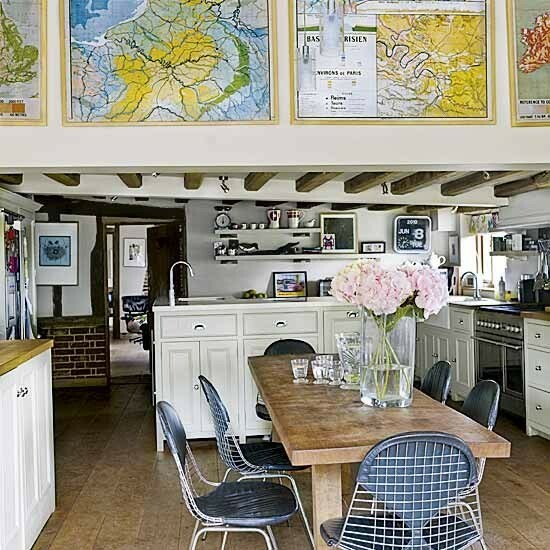 The look of this kitchen will make you want to travel! At the same time, the cottage feel of this kitchen will certainly make you want to just simply rest and chill in your home. So, which of these eclectic design ideas did you like?